American Indians/Alaska Natives (AI/AN) are disproportionately affected by HIV. The CDC reported that HIV diagnoses increased in AI/AN from 2010-2014, while diagnoses most other race groups decreased (1). Despite this disparity, AI/AN communities are often left out of conversations on HIV prevention, which has directly resulted in a lack of patient education materials that are culturally appropriate for AI/AN people. In particular, there are few AI/AN-specific patient education materials on pre-exposure prophylaxis (PrEP), the pill that can prevent HIV. To address the need for AI/AN-specific PrEP education materials, Urban Indian Health Institute (UIHI) established a partnership with Project Inform, a national HIV and hepatitis C education and advocacy group to culturally adapt pre-exposure prophylaxis (PrEP) education materials. These new materials were based off of information previously created by Project Inform. To create these materials, UIHI conducted a survey on HIV knowledge, attitudes, and beliefs in self-identifying AI/ANs at local events. Results showed that 62% of respondents (195/317) had never heard of PrEP. 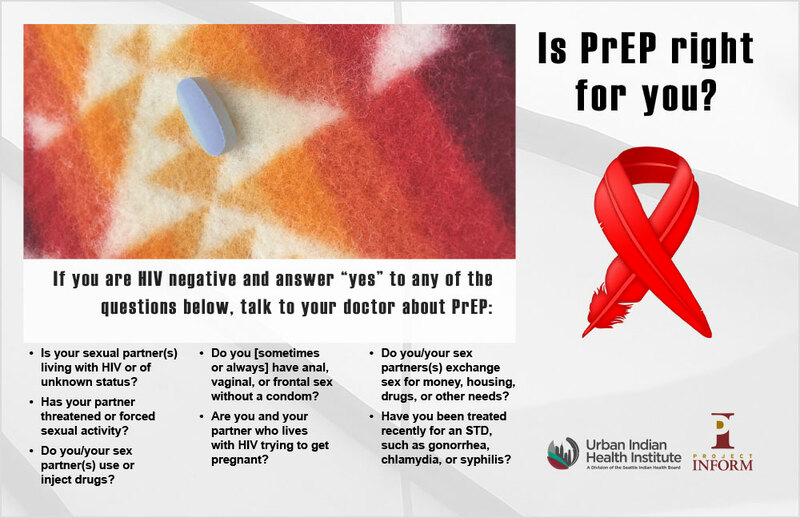 In addition to the survey, UIHI worked on creating a brief educational postcard by adding appropriate AI/AN imagery, including an HIV awareness ribbon in the shape of a feather, and information regarding PrEP access at Indian health facilities. Project Inform and other stakeholders (e.g. Urban Indian Health Program leaders, community members, etc.) reviewed the postcard and provided feedback on both the design and content. In addition, 10 AI/AN current or former PrEP users participated in key informant interviews to provide feedback on the postcard. The postcards will be distributed to all Urban Indian Health Programs and launched in 2018. In the future, UIHI will work with Project Inform to fulfill the need for materials targeted at AI/AN sub-populations, including Two Spirit people and heterosexual women. 1. CDC. (2015). HIV surveillance report: Diagnoses of HIV infections in the US and dependent areas, 2015. For more information on the HIV, STI, and Hepatitis C work being done at UIHI visit our website.